Yarn plays an important role in textile spinning. Defect free yarns make the successive process very smooth and easy. If there are defects in yarn and it cannot be identified before weaving or knitting or yarn dyeing process, then it will be very costly damage for the manufacturer. As its importance, yarn should be checked or inspected not only during spinning but also in weaving, knitting or yarn dyeing processes. 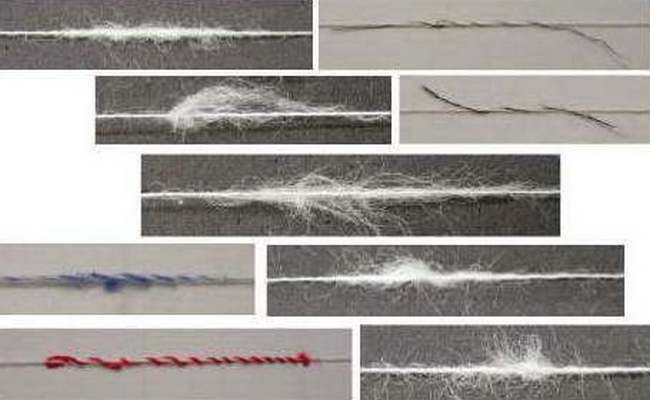 There are different types of yarn faults arise in textile industry. This article is presented some common defects of yarn with their explanations. Slubs are fish-shaped thick places from 1-4cm long and about 5-8 times longer than the average yarn diameter at the thickest portion. Crackers are short coil like places in the yarn. When the yarn is stretched the coil like fault gets straightened sometimes with a cracking sound, which is the reason for naming this fault as cracker. As the name itself suggests, this type of yarn fault consists of the yarn becoming double in its thickness at some portions. This fault is seen in the fabric as thick yarn in the warp or weft. Extra thick piecing at the ring frame tends to increase the end breakage at winding. Double gaiting refers to the ring frame tenders bad practice of piecing an end break by putting on a fresh length of yarn on the bobbin instead of stopping the ring bobbin or tube and piecing up the broken end. Slough off is the result of a package fault by which coils of yarn slip off the package during unwinding of yarn from the bobbin at winding machine. Bottoms are bobbins that are rejected in winding with a substantial quantity of yarn left over.